We’re incredibly proud to announce that Sublevel Zero is now available on PlayStation 4 and Xbox One in the form of Sublevel Zero Redux! Redux is an expanded, enhanced and remastered version of Sublevel Zero, and we’ve taken this opportunity to improve upon the original. With a revamped campaign, difficulty levels, a teleporter system, new enemies and unlockable elite variants of existing enemies, we’ve refined and extended loads of the game. We’ve put a lot of hard work into it and we’re very proud of the result! So – if you’re interested in playing the first Descent-like 6DoF shooter on console in over a decade, Sublevel Zero Redux awaits! 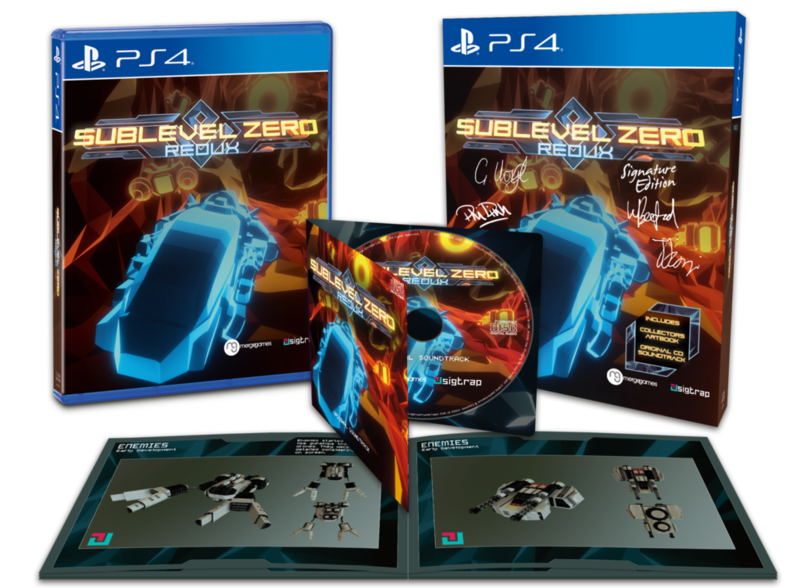 You can find links to buy on the PS4 and Xbox stores on the Sublevel Zero page, buy a limited PS4 Signature Edition boxed copy with collector’s art book and remastered OST CD, or buy a boxed retail copy for PS4 online. We can’t thank you enough for all your support thus far, and we hope you enjoy the fruits of our labour!